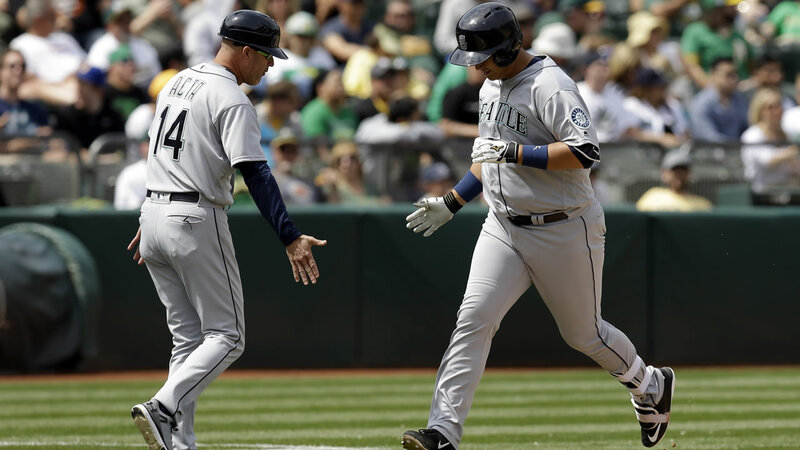 OAKLAND, Calif. -- Dae-Ho Lee hit a go-ahead two-run homer in the seventh after an earlier solo shot for his first career multi-homer game, and the Seattle Mariners rallied for a back-and-forth 9-8 win over the Oakland Athletics on Wednesday and their first 2016 series sweep. Mike Montgomery (1-0) pitched two scoreless innings for the win on a day Nelson Cruz also homered, a rare shot into the second deck of seats in dead-center. Lee hit his third and fourth homers, connecting in the seventh against John Axford (2-1) as the Mariners had a season-high 16 hits and improved to an AL-best 11-4 on the road. The A's lost their fourth straight. Sean Manaea was denied his first career win despite Oakland getting to nemesis Felix Hernandez on consecutive fifth-inning errors. Hernandez appeared poised to become the winningest pitcher in Mariners franchise history with victory No. 146. One error came when the ace fumbled Josh Reddick's dribbler with a chance to throw out the tying run at home. Khris Davis' grounder got past third baseman Kyle Seager moments later as the A's scored two more for a 6-4 lead, and Hernandez's day was done. Cruz connected for a two-run drive to highlight Seattle's four-run fifth against the rookie left-hander Manaea, making his second big league start. But that lead was short-lived as the A's came back for an 8-4 advantage they would then squander. Hernandez matched his shortest outing against Oakland of four innings on May 16, 2006. The bullpen delivered. Joel Peralta struck out two in the eighth, and Steve Cishek earned his eighth save in as many tries. Marcus Semien hit his team-leading seventh home run in the third off Hernandez to put the A's ahead, and Billy Butler drove in two runs including a run-scoring single in the fifth. Butler made his first start at designated hitter in a week and only his ninth in the first 29 games. Manaea hung tough after Cruz's big blast while opposing one of baseball's best pitchers. The lefty, who made his major league debut last Friday against Houston after only 42 appearances in the minors, allowed four runs, all earned, on seven hits in five innings, struck out six and walked one. He punched his pitching hand into his glove in celebration after retiring Norichika Aoki on a groundout to end the third. Aoki hit an infield single in the fifth and has hit safely in his last 15 games against Oakland. Ketel Marte followed with an RBI double before Cano's RBI single. Aoki added a sacrifice fly in the sixth. Seattle is 8-0 in the last eight one-run games at the Coliseum. Sean Doolittle hadn't allowed a run over his previous eight games and 6 1/3 innings before surrendering two runs in two-third of an inning. Hernandez is 11-3 at the Coliseum, one win shy of Tommy John for most career victories by a visiting pitcher in Oakland.